Extreme weather hits from time to time in Longmont, from hail storms and excessive winds to tornadoes and flash floods. While powerful storms can cause damage without leaving you time to prepare, there are steps you can take to protect your home, family, and yourself. If your home has experienced damage from a storm, know that Rapid Dry is here to promptly assist with disaster recovery and restoration services. With water and storm damage technicians on call 24/7, we assess your home and begin the restoration process immediately. Whether your home has been affected by severe weather or not, the following is a list of extreme storm conditions and how to weather each one. Along with the high winds accompanying tornadoes and thunderstorms, there also comes the possibility of hail. These dense balls of ice are created from an extreme drop in temperature and range in diameter, from small pellets up to the size of a quarter and larger. Hailstones can cause bodily injury, break windows, total cars, and damage roofs. Depending on the strength and severity of the storm, hail continues to grow in diameter until the updraft can no longer support the weight of the ice. When this imbalance occurs, the hailstones fall to the ground. If you’ve ever witnessed one side of a house or car damaged by hail, while the other remain unscathed, it’s likely due to excessive winds forcing hail to fall at an angle. Although the most thunderstorms take place in Florida, Colorado, Wyoming, and Nebraska experience the most hail storms each year. The area where these three states meet is called “hail alley”—and it averages seven to nine hail days annually. Since freezing temperatures in these high plains are found much closer to the ground, hailstones have less time to melt before hitting the earth. 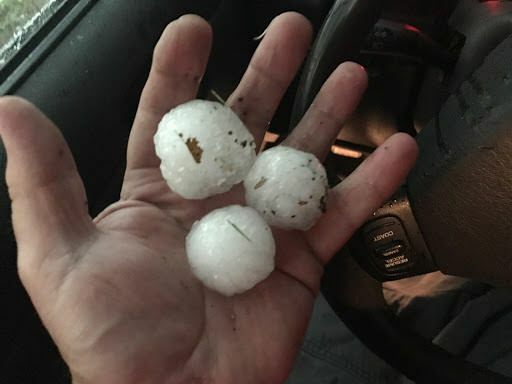 If your Longmont area has recently been hit by hail, you’ll need to assess and report any home, car, or property damage to your insurance. While some insurance policies cover hail damage, there can be exceptions. If you live in hail alley, check your policy to ensure you’re covered for major damage when a severe storms hits. While not all thunderstorms bring heavy amounts of rain, severe weather can cause unexpected flash flooding. If a flash flood warning is issued in your area, it is important to stay alert and get to higher ground when necessary. Due to the rapid rise and incredible speeds of flash floods, they are the most destructive and dangerous kind of flooding. In fact, flooding in the U.S. kills more people each year than lightning, hurricanes, or tornadoes. Although it is difficult to be prepared for a flash flood, knowing what signs to look out for can help keep you and your family safe. If you live in a mountainous area, near a river, by a dam, or in a low-lying plain, you are more likely to experience a rapid rush of water. This flooding is often caused by ice or snow melt, heavy rainfall on dry land, or levee and dam failures. Since flash flooding can last days, or be over in a matter of hours, it is important to act on water damage as quickly as possible. Even a few inches of water can have lasting effects on your home and health if not properly removed. If your area has recently undergone flash flooding and your home has water damage, you may want the help of an expert water remediation company. Incredibly powerful and destructive, tornadoes are high-density wind funnels that bring along hail, rain, and excessive winds. If your area is issued a tornado warning, you should seek shelter immediately—flying debris and high winds can cause a very dangerous situation for you and your family. While under a tornado warning, you’ll want to move to the innermost part of your house, with the most secure structure and the least amount of windows. Oftentimes a bathroom, bathtub, closet, cellar, or basement is the best place to take cover. After the extreme weather passes, check for local updates on your radio, television, or social media channels. If you go outside, be careful to avoid downed power lines and debris. When checking on neighbors or going through town, stay out of damaged buildings until they have been declared safe by Longmont authorities. To protect your home and property, take steps to prevent further damage (as insurance may not cover damage that occurs after the storm). Cover any holes in your roof or walls with a tarp to slow water damage, and use flashlights to avoid accidental fires. As a full-service restoration company, we understand life happens—and it is not always easy to predict a damaging storm. If extreme weather causes broken windows, waterlogged carpets, a flooded basement, leaky roof, or more, let us lend a hand. Our team at Rapid Dry Restoration is on-call 24/7 to help remove water and restore your home. As a licensed general contractor in Longmont, Colorado, we can take on any size project to make sure your home is even better than before! Damage from an intense storm can be overwhelming, but we can take the reins and start the water removal process to bring you peace of mind. We work with ALL insurance carriers to make sure you, as the homeowner are represented and fully taken care of. Whether your living room is drenched in water or your roof has water running down into your house, we are here to help with the restoration process. Don’t hesitate to call us for all of your storm damage needs.